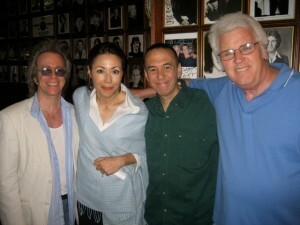 On June 15, 2008, I was at The Comic Strip with Ann Curry, and Gilbert Gottfried and we were giving Ann tips on how to do stand-up comedy for some kind of event she was preparing for. And despite the fact that I had been there for so many years, and had seen the walls before, I found myself transfixed by all the amazing memorabilia that I noticed that day. Jeffrey Gurian, Ann Curry, Gilbert Gottfried, and Richie Tienken on the day that Jeffrey suggested doing a book on the iconic Comic Strip! I didn’t know that other people had suggested that to him before but for some reason he wound up not doing it with them. He came to my home for a meeting and ended by saying “You have more photos on your walls than I have at the club”, and he decided to trust me with telling his story, and the stories of all the huge stars that came out of the club. 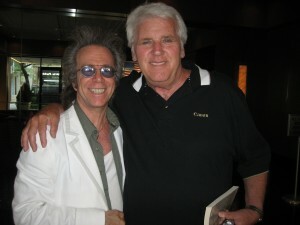 Jeffrey Gurian and Richie Tienken in the lobby of Jeffrey’s building after their meeting to agree on doing the book! The club officially opened on June 1, 1976 with Billy Crystal as the opening act. On JUne 17th a young, and unknown Jerry Seinfeld walked in to audition. In those days people were graded on their auditions. Jerry was graded “Good”, and then someone wrote on his sheet, “Definitely put on Mon. 6/21!” Whoever that person was had a good eye for comedy! Jerry stayed at The Strip for four years until he left for LA in 1980. It was his home club. 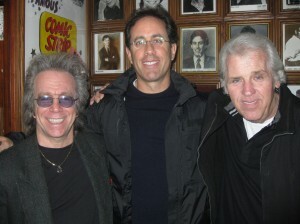 Jeffrey Gurian, Jerry Seinfeld, and Richie Tienken on the day of Jerry’s interview for the book! In the book Jerry said he felt like he was born in 1976, because that’s when he began working at The Strip and that felt like the start of his life! Eddie Murphy spent his early years at the club, and Richie Tienken was his manager for the years when Eddie was the biggest star in the world. That period of time spanned his days on SNL through Beverly Hills Cop 2. The one night in 1986 Eddie came into The Strip and asked to see a Black comic. The only one around was a 19 year old Chris Rock who was setting up chairs in exchange for stage time, and had only performed for very small audiences at 2 or 3 A.M. Not wanting to disappoint Eddie, they put Chris up in front of a packed house on a Friday night, and Chris killed it in front of his idol. 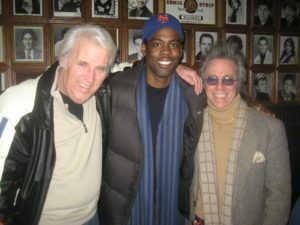 Richie Tienken, Chris Rock, and Jeffrey Gurian at The Strip on the day we did Chris’ interview for the book! That was the start of Chris’s rise to stardom. 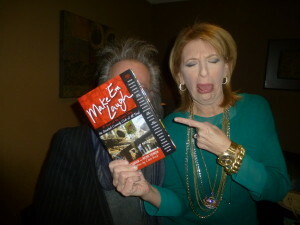 He hasn’t lost his gratitude for all that Richie did for him and wrote a fantastic, and funny introduction to the book. He also came into the club and gave Richie and I a really super interview. Most of the big stars came into the club for their interviews because Richie and I felt that being surrounded by those four walls would bring back memories, and we were right. Alan Colmes who many people don’t even know started his career as a stand-up comic came in wearing his 30 year old Comic Strip jacket that looked as if it was brand new. 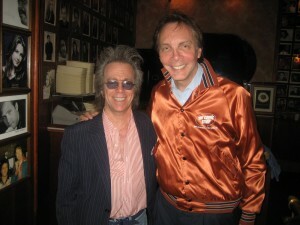 Jeffrey Gurian with Alan Colmes wearing his original 30 year old Comic Strip jacket, which looked brand new! In the middle of Paul Reiser’s interview he suddenly recalled what started the annual New Years Day brunch attended every Jan. 1, by himself, Jerry Seinfeld, Larry Miller and Mark Schiff. There had even been a fifth member of the group, a friend named Michael Cain but he passed away very young. 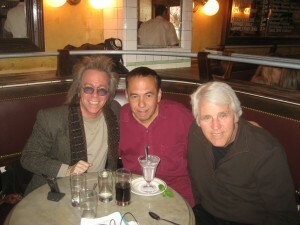 Jeffrey Gurian, Gilbert Gottfried and Richie Tienken at lunch at Pastis where GIlbert spent most of his interview denying he had ever been at The Comic Strip. He did say they had good electricity though! And then I flew out to LA to get an in office interview with Billy Crystal the first comic to hit the stage on opening night, back in 1976. Other comics interviewed were Ray Romano, Susie Essman, Jim Gaffigan, Judah Friedlander, Larry Miller, George Wallace, Rick Overton, who has also gone on to have a very successful acting/film career, Jim Breuer, Tony Rock, Adam Ferrara, plus newer stars who frequent the club like Colin Jost and Jay Pharaoah from SNL. Thanks to our agent J.L. Stermer from N.S. Bienstock, we got a deal with Skyhorse Publishing and the book is 250 pages down from the 500 I started out with. It took three years to get all of the interviews done and transcribed, because I did it myself by hand just by playing the interviews over and over again, and the fourth year was about editing and getting it down from 500 pages to the 250 that was needed. It was often a grueling process, but always a labor of love! Since it came out, it’s gotten great reviews, tons of press, and lots of celeb attention as you can tell from the following photos.